While leaders and policymakers have been trumpeting the end of the recession, are we really on the cusp of recovery? Knowing at which stage of the recession we are in is critical because we are dealing with millions of livelihoods throughout the world. A wrong judgment may mean the difference between getting on with or giving up on lives. Recessions have much in common with plagues. Both create uncertainty and fear; uncertainty of being hit and fear of the severity of the affliction. A lot has been written on the history of plagues. But the one highly regarded is by the eminent historian, William H. McNeill. Plagues can be categorised into several phases: epidemic, pandemic and endemic (note that by the time a disease is endemic, it's no longer a plague). To begin with, an explanation of the terms is helpful. Epidemic, formed from two Greek root words, epi and demos meaning above and people, refers to an outbreak of a disease that spreads quickly to a large group of people within a specific location and within a specific time frame. Pandemic - pan for all - on the other hand, is far more virulent as the disease disperses over a very wide area, which now is synonymous with a global diffusion, and thus affects many, many more people. Endemic - en for in - is the stage where the disease and host have adapted to one another. The disease, now less virulent, is commonly found among the people and aside from causing discomfort, is no longer fatal to the host. They have evolved towards a stable pattern of co-existence. To better understand the cause of the present economic crisis, we have to undertake a forensic pathology on economic recessions in recent times. But first, a lesson in economic recession. An economic recession can be of two varieties: an inflationary one caused by a rapid increase in money supply unmatched by a corresponding increase in goods production, and a deflationary one caused by surplus goods production in an environment of rapid money contraction. How can money appear and disappear in vast amount in so short a time? For this, we have to thank two modern innovations: credit banking, the major player, and the printing press which plays a supporting role. In our modern economy, credit represents more than 90 percent of the money in circulation with paper making up the balance. So it's very easy to inflate or deflate the money supply. Our familiar paper money doesn't suffer that much from this disappearing illusion, only the virtual money. The other leg of the equation, goods production, has been playing an increasing role since the start of the Industrial Revolution. Actually, the technology waves triggered by the Industrial Revolution have unleashed the energy stored over millions of years in the form of coal and oil fossil fuel. This translates into a massive leap in goods production. Helping to wipe up these additional goods are the innovations in transportation and communication that move goods cheaply or make comparisons about prices widely available. Generally such advances are synonymous with capitalism since they require substantial capital. More savings are channeled into investment capital further raising goods production. Eventually too much of a good thing turns harmful. Production exceeds consumption generating negative returns on the invested capital. In time the capital will be written off. This is the scenario of a deflationary recession. What about inflationary recession? This occurs at the early phase of a technology wave. Demand is growing but production lags behind. The banks lend more to meet the need for more money to buy goods but production still can't catch up. More money translates into higher prices. Solving this is easy; you raise the price of money, that is the interest rate. Money supply reduces and things return to normal. Over time production rises to meet the increasing demand. The recession happens when the money supply is crimped. Jobs are lost as businesses retrench. Of the two, deflationary is the more malign because reducing supply is much harder than increasing it. Businesses will continue running at a loss until many go bust. Recovery takes a long time. To demonstrate that inflation prevails during the run-up to the crest of the technology wave while deflation as the wave matures, the US inflation for the years 1914 to 2007 taken from the Wikipedia site, shown below, would be instructive. The third wave ended around 1950 after cresting in 1920 (The story of the whole five waves will appear in a future post). You can observe that from the 1920s to the 1930s, the period was wrapped in deflation. In the 1940s, it would have been deflation had not the Second World War diverted the production capacity to arms production. Indeed traces of deflation still reared its ugly head at the end of the war. After the war, the need for housing to house the American families in the suburbs fueled the demand growth. Highway construction was carried out on a grand scale and automobile sales correspondingly rose. 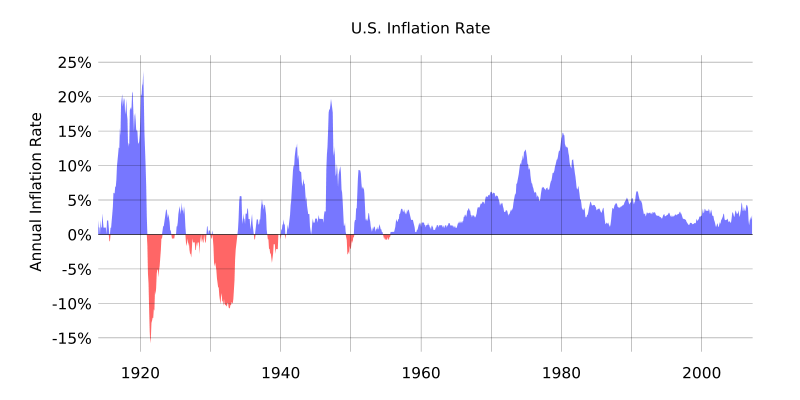 A baby boom in the 1950s to the 1960s rounded off the demand growth story. After 1950, the upsurge in demand raced ahead of supply until it reached the turning point in 1990. My future post will describe why inflation nowadays can only become an epidemic and a tempered one at that but deflation can transcend from epidemic to pandemic and eventually becomes endemic. Like its disease counterpart, the epidemic spreads from countries to countries while the pandemic comes in waves.